The saying in baseball is that momentum is only as good as tomorrow's starting pitcher. In football, with a week between games, last week's miracle is often quickly forgotten the first time a linebacker knocks the stuffing out of a running back. So here's a look at some of the wildest endings to playoff games and whether there was any residual effect. Most times, Eagles fans will note, teams that won with fantastic finishes often lost the following week. One notable exception was in 2003, when the Panthers won in double overtime before coming to Lincoln Financial Field and spanking the Eagles in the NFC championship game. 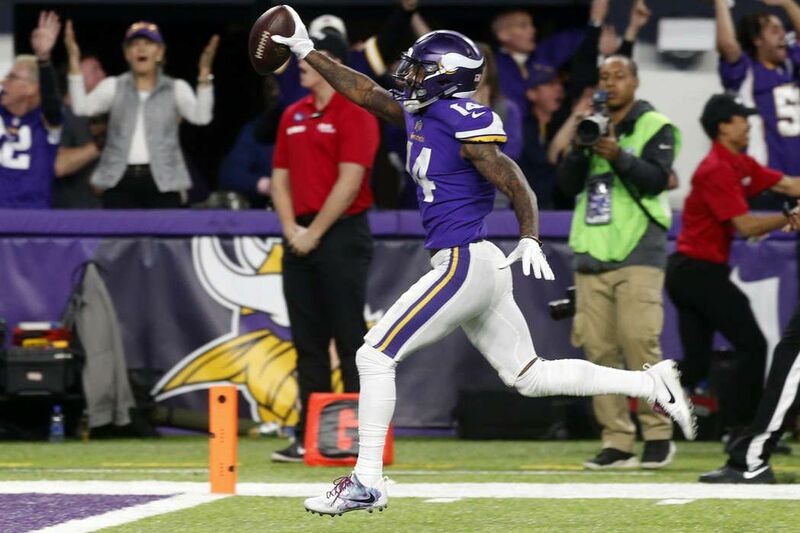 This isn't meant to be a comprehensive list, just something to think about when that Stefon Diggs replay from Minnesota's win over New Orleans last week is shown for the 250th time. Steelers 13, Raiders 7: The Immaculate Reception was neither Immaculate nor a Reception, if you ask Raiders fans. The inconclusive replay of whether Franco Harris caught the ball before it hit the ground – and whether it had hit teammate Frenchy Fuqua after the collision with Oakland's Jack Tatum – makes it one of the most compelling plays in American sports history. The next game: The Steelers lost in the conference championship game to the Dolphins, who would finish the season 17-0. The Immaculate Reception game was the first playoff win for the Steelers in their history. Cowboys 17, Vikings 14: Before Roger Staubach threw a 50-yard touchdown pass to Drew Pearson, he said a Hail Mary to himself, introducing new meaning to the Christian prayer. The next game: The Cowboys went to L.A. and overwhelmed the Rams (37-7) before losing Super Bowl X to the Steelers. 49ers 28, Cowboys 27: Dwight Clark's 6-yard fingertip reception would launch a dynasty and forever be known as "The Catch." By the way, the 49ers were three-point underdogs that day. Woof, woof. The next game: San Fran won the first of its four Super Bowls during the 1980s. Yeah, they rode the momentum. Bills 41, Oilers 38: Frank Reich threw four touchdown passes as Buffalo rallied from a 35-3 second-half deficit in the largest comeback in NFL history. The next game: The Bills beat Pittsburgh and Miami on the road before getting overpowered by Dallas in the Super Bowl (again). 49ers 30, Packers 27: Terrell Owens took a major pop but held on for the game-winning touchdown catch with 8 seconds left to cap what had been a mostly miserable day for the mercurial wide receiver. The Packers had eliminated San Fran each of the previous three playoffs. The next game: Running back Garrison Hearst broke his ankle on the first play and the Niners lost at Atlanta, 20-17. Titans 22, Bills 16: Some call it the "Music City Miracle" because of the lateral from Archbishop Ryan graduate Frank Wycheck that resulted in teammate Kevin Dyson's 75-yard touchdown with 3 seconds left. Others call it that because Tennessee was laying 5. The next game: The Titans won a pair of road games before coming up a yard short against the Rams in Super Bowl XXXIV. Packers 33, Seahawks 27 (OT): Al Harris ended it with a 52-yard interception return on Seattle's second series of overtime. It was the first defensive score to end a postseason game in history. The next game: The Packers were cruising to a win over the Eagles. All they had to do was stop a fourth-and-26 play with 72 seconds remaining. Panthers 29, Rams 23 (2 OT): Steve Smith ended it with a 69-yard catch-and-run in what turned out to be the last playoff game played in St. Louis. The next game: The Panthers went to Philadelphia and shut down the Eagles in the NFC title game, and came within a whisker of winning a Super Bowl if not for that Brady guy. Eagles 20, Packers 17 (OT): Freddie Mitchell's Eagles career was mostly forgettable except for converting the aforementioned fourth and 26 to help force overtime. The next game: In arguably the ugliest of Andy Reid's conference championship losses, the Eagles could get nothing going against Carolina, and lost Donovan McNabb to injury and the game, 14-3. Eagles wide receiver Freddie Mitchell catching a Donovan McNabb pass for a first down on fourth and 26 in the fourth quarter on Jan. 11, 2004. The play kept alive the drive that led to a field goal to tie the score and send the game into overtime. The Eagels beat the Packers, 20-17, to advance to the NFC championship game. Cardinals 51, Packers 45 (OT): In a game in which 90 points were scored, the overtime winner would come on a defensive touchdown. Forgot Cardinals kicker Neil Rackers missed a 34-yard field goal in the waning seconds of regulation. The next game: The Cards defense was garbage again in a 45-14 loss to the Saints. Broncos 29, Steelers 23 (OT): Tim Tebow hit Demaryius Thomas with an 80-yard touchdown pass on the first play of overtime. Talk about disrespect: The Broncos were eight-point underdogs. At home. The next game: Reality set in. The Broncos were hammered in New England, 45-10, as 13-point 'dogs. 49ers 36, New Orleans 32: Alex Smith threw a 14-yard touchdown pass to Vernon Davis with 9 seconds left to cap a ridiculous final four minutes in which each team scored two TDs. The next game: San Fran lost to the visiting Giants in overtime. The winning field goal was set up by Kyle Williams' fumble on a punt return. Ravens 38, Broncos 35 (2 OT): The Ravens were down seven with less than a minute left and looked DOA. But then Jacoby Jones somehow got behind the secondary and took Joe Flacco's pass 70 yards for a touchdown to tie it with 31 seconds left. The play has been dubbed the "Mile High Miracle." The next game: The Ravens, 9-point underdogs to Denver, won at New England (7.5-point favorites). Two weeks later, they beat San Fran in a memorable Super Bowl. Seahawks 28, Packers 22 (OT): Seattle trailed, 19-7, with less than four minutes left and forced overtime with two touchdowns, a two-point conversion, and a recovered onside kick that Green Bay's Brandon Bostick flubbed. The Seahawks won it in OT when Russell Wilson hit Jermaine Kearse for a 35-yard TD. The next game: Seattle's Pete Carroll committed one of the all-time coaching gaffes by electing to throw the ball at the end of Super Bowl XLIX instead of handing it to stud running back Marshawn Lynch. Cardinals 26, Packers 20: Green Bay tied the game at the gun on a Hail Mary from Aaron Rodgers to Jeff Janis only to lose in overtime when Carson Palmer hit Larry Fitzgerald on consecutive plays of 75 and 5 yards for the touchdown. The next game: Arizona was drilled at Carolina in the NFC title game, 49-15.